I am ever excited about the many interesting wines that are coming from Chile. This one is the creation of the exceptional Valle de Aconcagua vineyard called Errazuriz. It is a beautiful wine of 97% Carmenère and just a touch of 3% Shiraz. While Carmenere is a prominent grape in Chile many who enjoy it do not know it is also know by wine historians as the “lost grape of Bordeaux.” Many decades ago it was one of the major grapes of the Médoc region. Even under the best of circumstances, it was a difficult grape to grow in Bordeaux, but in Mediterranean like climate of the Valle de Aconcagua with it's warm summers and cool Pacific Ocean breezes this grape seems to do well. This wine has a distinctly Bordeaux character and we enjoyed it immensely with dinner of South American cuisine. Selling at between $16+20 it is an excellent value. I thank my friends at Vintus Wines for the introduction to this excellent wine. Here is a beautiful and easy to make summer cocktail that your guests will adore. It is made with fresh watermelon juice; Cava, the luscious sparkling wine from Spain, fresh lime juice and the wonderful and healthy sweetener, Agave Nectar. It can be made as a punch or if you are in to presentation blended as served. I garnish with a lime slice and fresh mint leaves. When we talk about Italian red wine the first thing that pops into may people's mind is the straw covered bottles of Chianti that were once almost synonymous with Italian red wine. Much has changed since then and Chianti from Tuscany has gained a much more sophisticated identity among wine lovers. This wine is made with the renowned Italian grape Sangiovese which I love with dishes like a Pasta Bolognese. A dish I make with a recipe handed down for generations in handwritten notes from my friend's family in Italy. This Chianti, Nipozzano Reserva, from the Rufina area of Chianti, Tuscany, Italy, also has a rich family tradition and was a perfect pairing to the dish. The wine is artfully produced at the Castello di Nipozzano Estate where the Frescobaldi family has tended to the vines for 30 generations. Burger Deluxe on Route 23 in Wayne, NJ is a fun dining experience. Created by the Livanos Restaurant Group who are best know for their very fine New York City Restaurants, Molyvos, Greek; Oceana, Seafood; and Abboccato, Italian. Burger Deluxe like City Limits in White Plains has a different angle. They have taken the best of the highway diner format, thrown in some lively design elements and added a very diverse menu. All together you've got a modern day retro diner that is all fun. If you've been to Providence you most likely have dined at the well loved restaurant Al Forno. If you have not and are planning a trip you must put this exceptional, casual yet exquisite Italian restaurant on your itinerary. In summer there is a lot of al fresco seating in their garden settings, but we like the open bar the best. It is set back but open to the fresh evening air. This trip to Providence, RI intensified my delight in this wonderful little city. During his six weeksat RISD my son had become a regular at this Providence institution Geoff's Superlative Sandwiches and he was excited to take us there. In Montclair, NJ, Watchung Deli serves up a terrific array of delicious sandwiches but Geoff's is a whole nother story. With what must be over 100 variations, not counting whatever you can dream up yourself, Geoff's has got to be the king of all sandwich shops. Cava is the sparkling wine of Spain. It has been made in the Spanish wine region of Catalonia since the 1800's. In just one little town outside of Barcelona with a population of just 11,000 over 11 million cases of Cava are made. It enjoyed some popularity in the States as the sparkling wine Freixenet which many drank in place of Champagne because it was cheap. But Cava's reputation as a quality wine lagged and it lived in the shadow of Processco and other fine alternatives to Champagne. That is changing. I predict that Cava will be the hot sparkling wine this Summer. Why? you ask. Well as Eric Asimov reports in this NY Times Article "Cava, the Prosecco of Spain, Gets Its Due — at Last", he and many others are recognizing that there is great enjoyment in the better productions of this wine. 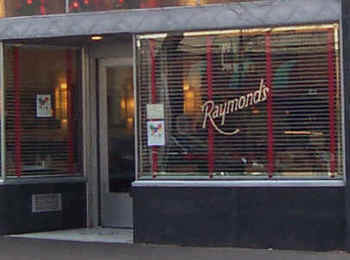 Dined at Raymond's twice this past weekend on request. They are on top of their game. Dinner was perfect both nights. This review written 4 years ago still holds true. Winner of NJ Monthly's 2009 Readers Choice award for best breakfast. The place could be a winner in other categories.